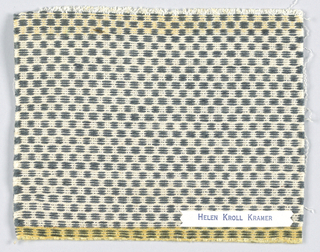 Helen Kramer Kroll is best known for her handwoven upholstery and drapery for interiors. In the 1930s, she attended the Traphagen School of Design in New York, focusing on costume design. 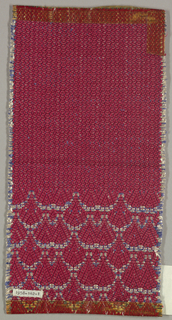 Upon graduating, she traveled throughout Europe to hone her skills for fabric design. Kramer returned to New York City and opened a small shop on E 54th Street, and began to receive many commissions. 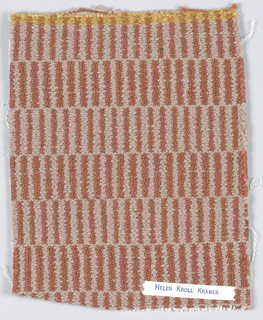 To meet the growing demand for her handwoven textiles, Kroll opened a showroom on Madison Avenue in New York with her brother, Boris. They named their firm Cromwell. During the early 1940s and in the midst of WWII, she accompanied her husband, a doctor, to the Ashford General Hospital in White Sulphur Springs, West Virginia.... more. 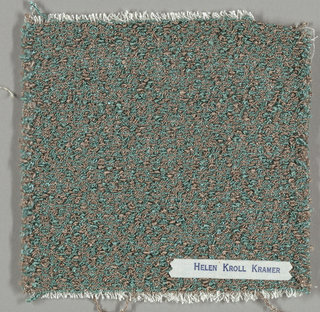 We have 351 objects that Helen Kroll Kramer has been involved with.